Murrumbidgee Magic is an award winning, dynamic female singing group whose members meet regularly to practise, perform, socialise and have fun. Started in 1992, we currently have about 35 singers of all ages, all walks of life and from all parts of the Wagga Wagga area and beyond. Our repertoire spans a wide and varied range, from Queen's 'Somebody to Love" to The Weather Girls' 'It's Raining Men', as well as songs with a distinctly Australian flavour, including 'Shelter' and 'I am Australian'. All songs are arranged in the distinctive barbershop 4-part harmony style. Very few of our singers have any formal training in music or singing, but vocal instruction is a regular part of chorus rehearsals and a very important component of the chorus experience. Throughout the year we get coaching from visiting educators to develop our singing and performance skills. Each year Region 34 holds a competition open to all Sweet Adeline choruses and quartets in Australia. Competitions are scheduled to take place in Hobart, Wollongong and Western Australia. Competitions are a special time for quartets and choruses to come together to sing for each other and receive constructive feedback from a panel of judges. The winners of the regional competition in both quartet and chorus categories travel to International Competition. 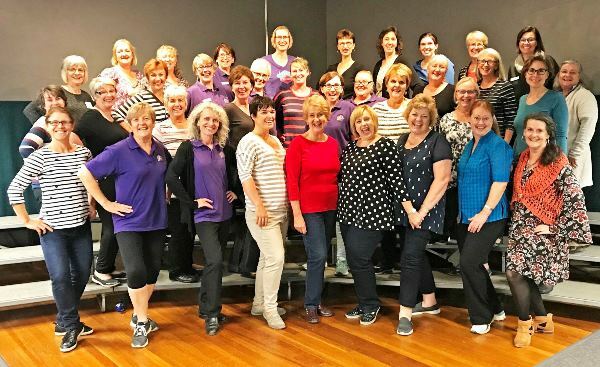 Murrumbidgee Magic Chorus is a chapter of Sweet Adelines International, a worldwide non-profit organization of approximately 28,000 members. We are a member of Region 34.of Sweet Adelines International.